The WWS 509 datasets page has a copy of the Gehan survival data, which were analyzed by Cox in his original proportional hazards paper. The data shows the length of remission in weeks for two groups of leukemia patients, treated and controls, click here for more information. 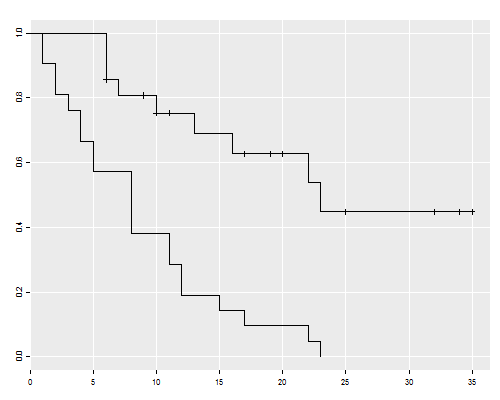 We analyze the data using R and Stata. As usual, the first task is to read the data. We also stset them and label the groups.
. label define group 1 "control" 2 "treated"
As you can see, 30 of the 42 patients had a relapse, with a total observation time of 541 weeks. The weekly relapse rate is 7.8%. The Kaplan-Meier estimators for the two groups are easily plotted using sts graph with the by(group) option. 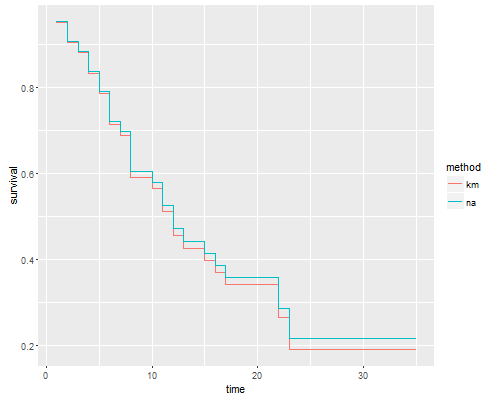 computed using survfit in the survival package and plotted using the generic function plot, or my own ggfy function, which makes base plots look a bit more like ggplot. This shows that after 23 weeks all patients in the control group had relapsed, but about half those in the treated group remained in remission. This reproduces Figure 1 in the notes. We can list the estimates using sts list. the summary() method. The convention is to list the survival function immediately after each time. In the control group there are no censored observations, and the Kaplan-Meier estimate is simply the proportion alive after each distinct failure time. You can also check that the standard error is the usual binomial estimate. For example just after 8 weeks there are 8 out of 21 alive, the proportion is 8/21 = 0.381 and the standard error is √0.381(1 - 0.381)/21) = 0.106. In the treated group 12 cases are censored and 9 relapse. Can you compute the estimate by hand? Only the distinct times of death –6, 7, 10, 13, 16, 22 and 23– are relevant. The counts of relapses are 3, 1, 1, 1, 1, 1, 1. When there are ties between event and censoring times, it is customary to assume that the event occurred first; that is, observations censored at t are assumed to be exposed at that time, effectively censored just after t. The counts of censored observations after each death time (but before the next) are 1, 1, 2, 0, 3, 0 and 5. When the last observation is censored, the K-M estimate is greater than zero, and is usually considered undefined from that point on. 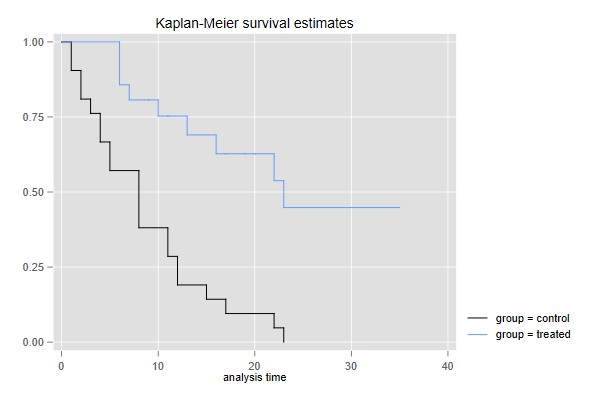 We can also compute the Nelson-Aalen estimate of the cumulative hazard, and then exponentiate minus the cumulative hazard to obtain an alternative estimate of the survival function. Stata’s sts list can compute the Nelson-Aalen estimate using the na option, and sts generate can save either estimate in a new variable as shown below. In R we can estimate the cumulative hazard “by hand” using counts of events and exposure. The two estimates are very similar. To test equality of survival curves in the two groups we can use the Mantel-Haenszel or log-rank test, available in the sts test command with the default logrank option. via the survdiff function. We see that the treated have fewer deaths than would be expected (and thus the controls have more) if the two groups had the same survival distribution: 9 instead of 19.25. The Mantel-Haenszel chi-squared statistic of 16.8 on one d.f. is highly significant. It is instructive to compute this statistic “by hand”. with rho=0 for log-rank, rho=1 for Peto-Peto, and rho=p for Fleming-Harrington with q=1. The tests using the survival as weight treat it as left-continuous.